Skoda today launched the Yeti facelift in India priced at Rs. 18.62 lakh for 4x2 and Rs. 20.14 lakh for 4x4 variant (Both prices ex-showroom, Mumbai). The Yeti facelift comes with some exterior changes and added equipment as well. The Yeti facelift will be available only in top-of-the line Elegance trim in both 4x2 and 4x4 variants. 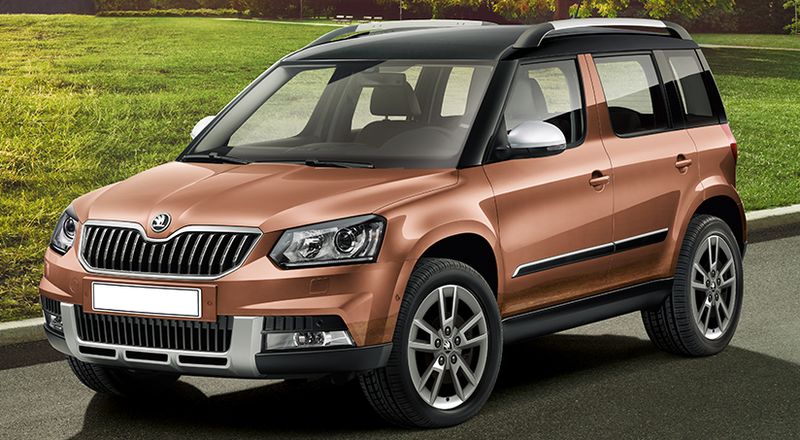 The Yeti facelift now matches with Skoda’s new design language. Changes in the new Yeti are – new front and rear bumpers, bi-xenon headlamps, LED tail-lamps, new housing for the wing mirrors, new alloys and colour options for the roof. Like all the Skodas, Yeti too now gets a new 3 spoke steering wheel. Additional features include keyless go, electronically adjustable driver's seat with memory function, telephony controls on the steering, electrically foldable wing mirrors and Bluetooth connectivity on the audio system. On the safety front, the Skoda Yeti gets cruise control, ABS, EBD, brake assist, tyre pressure monitors, ESP and hill-hold. There is no change under the hood. The 2.0 Litre TDI engine is retained from the old model. The engine generates two power outputs of 109 Bhp & 138 Bhp in 4x2 and 4x4 variants respectively coupled with 5 & 6 speed manual transmission.